The university in Mosul, Iraq’s second biggest urban hub, was an ISIS command centre. 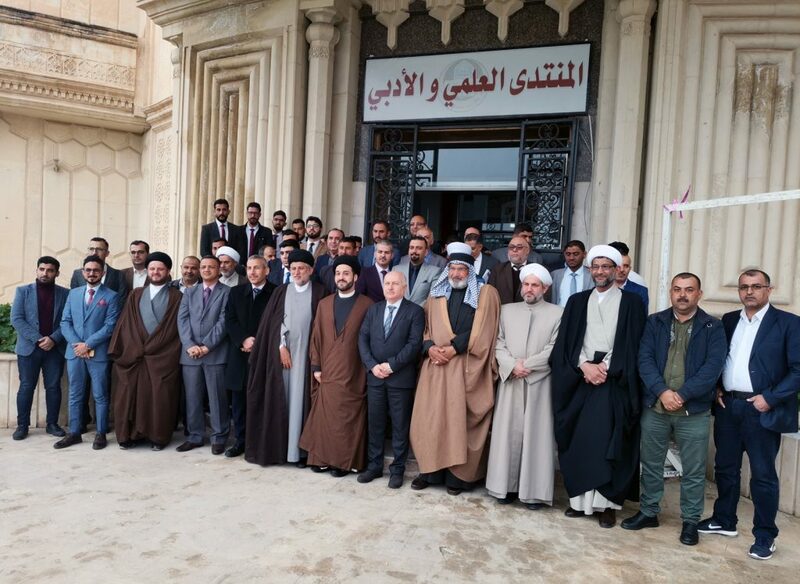 In March, CMI brought together members of Iraq’s various national groups at the university in an effort to ensure that Iraq’s recent tragic history does not repeat itself. Najafite Mohamed Bahr Al Aloom ate lunch together with Mosulites Ayman Al Aarajy and Bander Faris (behind). The darkened ruins of the university campus stand silent in the rain. Indoors, in the main hall you can make out the initials of Saddam Hussein on the rose-patterned ceiling. Iraq’s brutal recent history is conspicuous at Mosul university in many ways. Most recently it was in the grip of ISIS. It was one of the terrorist organisation’s command centres, and it’s laboratories were used for making chemical weapons. The campus was devastated in the fighting to liberate the university. ISIS fighters torched the university’s priceless library. By destroying thousands of precious books and manuscripts the terrorist organisation ISIS hoped to erase part of Mosul’s multicultural history. 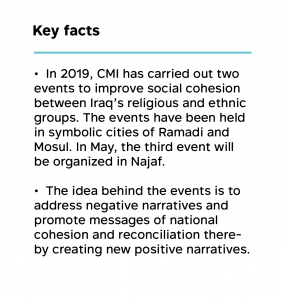 One day in March CMI brings together members of Iraq’s various national groups at the university in an effort to ensure that this part of Iraqi history does not repeat itself. The point is to deconstruct the antagonisms between religious and ethnic groups created by politicians and the media and to replace negative narratives with positive ones. A growing number of Iraqis are fed up with politics that sustain these divisions, and which contributed to the emergence of ISIS. A group of influential Shia Muslims have travelled for ten hours to Mosul from the holy Shia city of Najaf in southern Iraq. Among them are religious leaders, scholars, and civil society activists. At the university, Sunni Muslims, Christians, and Yazidis greet the Shias with open arms. There are speeches and some poetry. In particular, the message of the Shias, the majority grouping in Iraq, in favour of Iraq’s unity is a strong one. “All my life I’ve dreamt of going to Mosul. And now it’s come true. Iraq’s north-south divide must end. We are one”, exclaims head of delegation, the prominent Shia cleric Sayyed Jawad Al Khoei in his address. 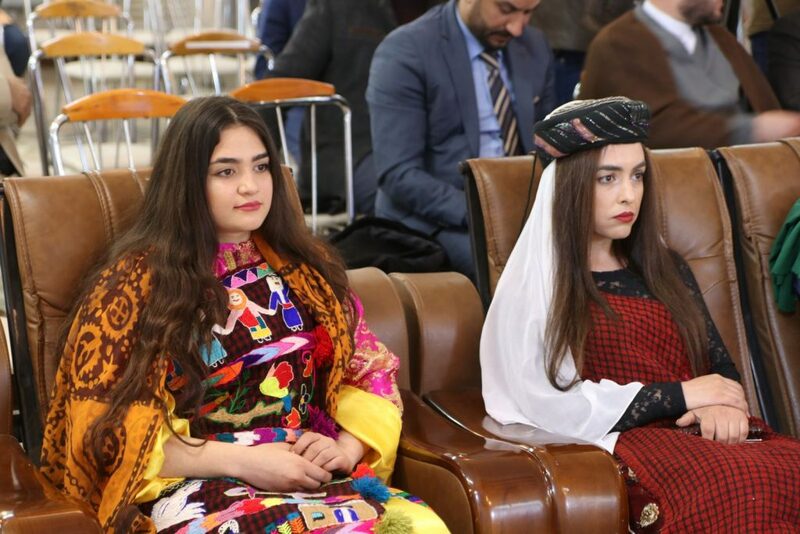 Diana Khaleel and Balsam Franso were dressed in traditional Iraqi Christian costumes. For the joint lunch, an important part in Iraqi culture signifying respect and welcome, there’s Quozi, slow-cooked lamb and rice, one of Iraq’s national dishes. 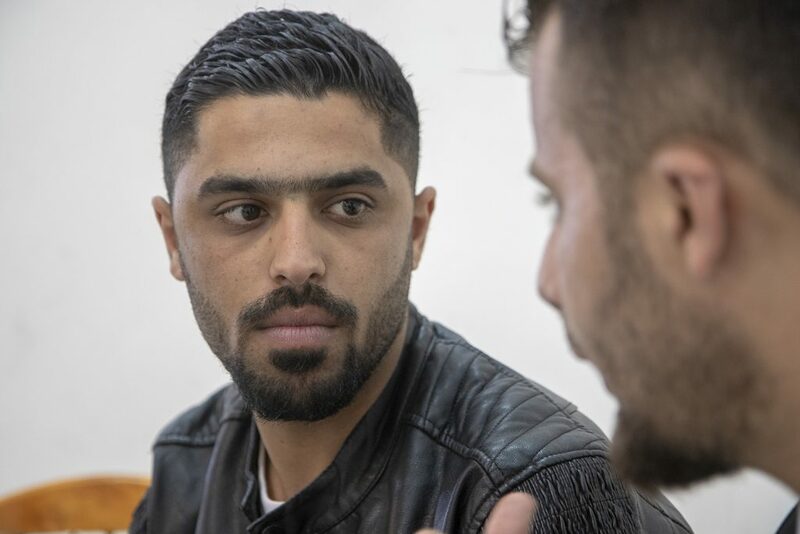 Mohamed Bahr Al Aloom, 26, from Najaf, sits at the same table as a number of the university’s current students and alumni. They discuss the way people from Mosul were grimly depicted as ISIS collaborators. “Today has shown me how things really are. 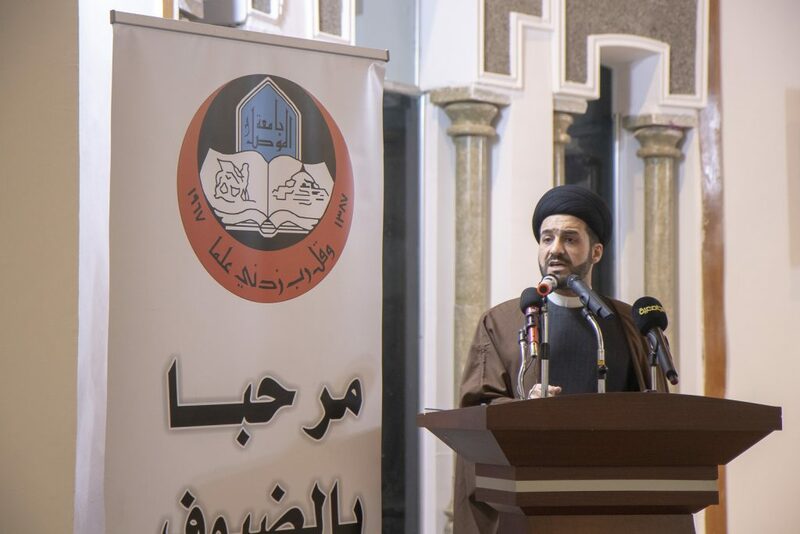 I think that the reality is that Mosul’s inhabitants are innocent”, says Bahr Al Aloom. Bahr Al Aloom points out that tensions between the different groups are due to antagonisms generated by the media and politicians, and by hate speech spread on social media. Bander Faris thinks that religion should be put to one side. Mosul – an encouraging example of peaceful coexistence? It’s 18 months since Mosul was liberated from the yoke of ISIS and life has gradually returned to the city. The reconstruction is nevertheless a massive task that is only just barely underway. Through its reign of terror ISIS sought to eradicate the soul of Iraq’s most multicultural city and sow mistrust between ethnic and religious groups. “ISIS left the city’s inhabitants with a profound trauma. Everyone was their victim, not just specific groups. Now we have to stick together to survive”, says Bander Faris, 22, a university student and civil society activist. In getting back on its feet, Mosul could become a source of encouragement for the whole country on how Iraqis could live in peace side by side. The day’s interactions at the university instil the feeling that it is above all the youth who can bring about a common future for the people of Mosul. The city’s majority grouping, Sunnis, are especially viewed with mistrust due to ISIS. This is why Faris has spent time with friends in Shia, Christian and Yazidi communities, so that young people get a better understanding of one another. 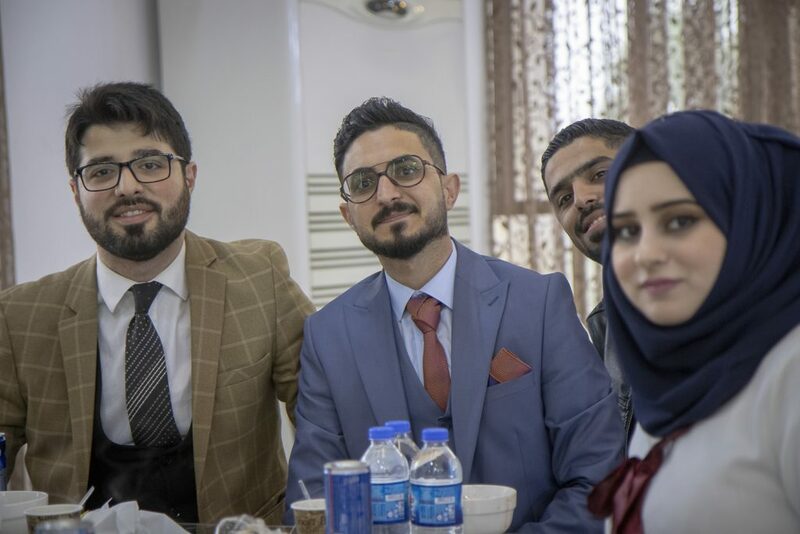 After Mosul was liberated, Faris and his friends were among the group of volunteers who cleared away the rubble and smashed furniture from the devastated old city. He shows a photo on his cell phone of young men perched atop a garbage truck in a narrow alleyway. The participants gathered at the entrance of the university building for a group photo. The university students say that the atmosphere in the city has become more tolerant since ISIS was expelled . “When we returned to Mosul, we noticed that where there used to be closedness there was now more openness. We learned a lot more about each other’s religions and ethnic background. This awareness increased mutual respect and cooperation”, explains Diana Khaleel, 21, who has come dressed in colourful traditional Iraqi Christian costume. At the same time the feeling is that there shouldn’t be such a big importance made of religion as before. For Khaleel and Faris this is the only way that Iraqis can learn to come together. “My message is let’s put religion to one side. That way we won’t have problems”, says Khaleel. “I don’t like the terms Sunni and Shia. They’ve generated so much hatred in the country. I’m first of all an Iraqi and secondly a Muslim”, stresses Faris. 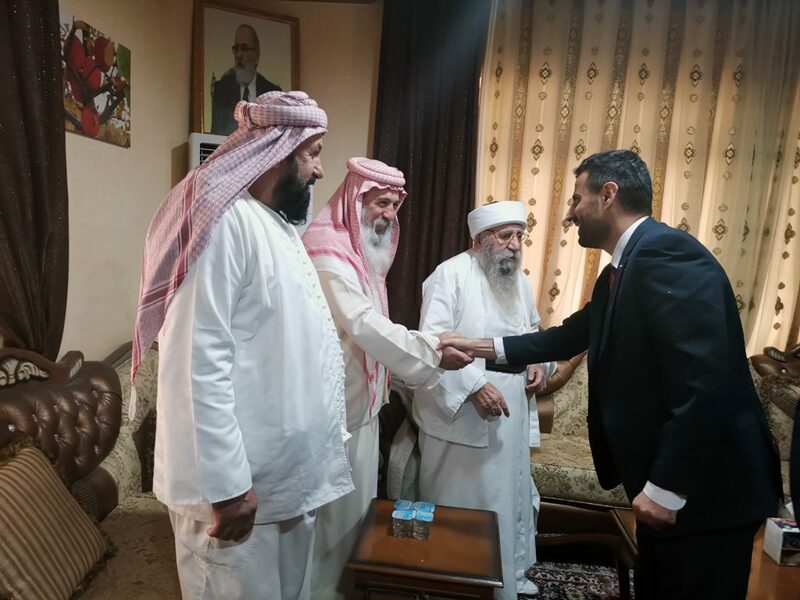 The Shia delegation visited also the house of Yazidis’ spiritual leader Baba Sheikh (center). Researcher Hayder Al Khoei (right) shakes hands. From Mosul the Shias continued on their journey to the heartland of the Yazidi faith in the mountains of North Iraq. There’s a downpour. By the roadside a solitary shepherd and his flock struggle against the hard rain. At the head of a narrow valley the convoy stops by a temple with a pointed dome. It was here at Lalish, the holiest place of their faith, that hundreds of Yazidis sought refuge from persecution by ISIS. Every Yazidi must make the pilgrimage to the temple at least once in their life. But this is the first occasion that a Shia delegation has visited Lalish. Visitors must leave their shoes and socks at the entrance. Inside, the Shia representatives pay their respects at the tomb of the Yazidi holy leader Sheikh Adi by circling it. The chant of the temple’s spiritual leader Baba Chawish fills the small chamber. The Yazidis have been the target for persecution for centuries. Over tea the Shias condemn all discrimination. “We welcome the Yazidis to Najaf. We open our hearts to them. They are an essential part of Iraq”, says delegation leader Sayyed Jawad Al Khoei. Hussein Hassoon, a representative of the Yazidis says that the day has been a momentous one. A reciprocal invitation has been accepted. The Shia delegation’s goal is to increase the understanding of Yazidis in Najaf. There is, for instance, hardly anything written in Arabic about their faith. Mohamed Bahr Al Aloom intends to share his encounters on social media and at various events. Both Mosulites and Yazidis are to be taken to visit the holy places of Najaf, such as the tomb of Imam ’Ali. “The goal is an open dialogue that results in respect for each other. Only genuine respect creates a real connection between people. It’s only this way that can we be a unified people”, says Bahr Al Aloom.